Allegations of racist threats surfaced this week at a high school in South San Jose after a family claimed a white teacher placed a noose around his neck while addressing a black student. 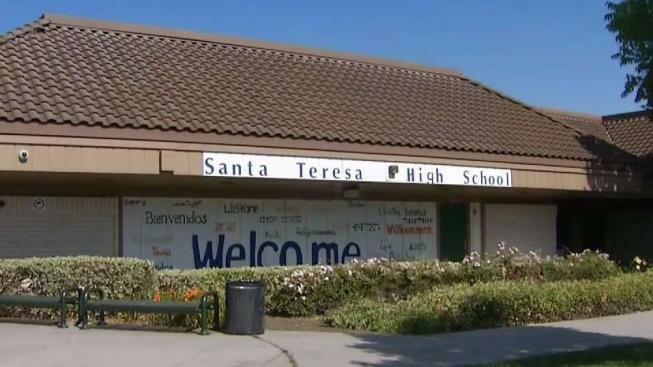 The incident occurred April 30 during a weightlifting class at Santa Teresa High school, and community activists believe it’s a hate crime. The teacher is on paid administrative leave. Officials with the East Side Union High School District confirmed they have credible evidence the incident happened, and the District Attorney's Office is reviewing the case. "The teacher made a noose-like structure and placed it around his own neck, and said, 'Stay away from me, blank. The student's name in the blank," community activist Tiye Garrett said. Activists in the African-American community are calling it a racial threat. "This is unacceptable," said Walter Wilson of the NAACP. "Our goal with the district is to file a civil rights lawsuit against this district." San Jose police Chief Eddie Garcia said his department investigated the case after being tipped off by the community. He’s concerned the district didn't report it to police. "I would have like to have heard from the institution itself," Garcia said. The chief also said the incident, if it proves true, highlights a troubling trend. "We have seen an increase in hate crimes and hate incidents in the community in 2017, but we are proud to investigate this crime," he said. Investigators handed the case over to the DA's office. District Superintendent Chris Funk issued a statement saying in part, "I am deeply disturbed and troubled by the allegations and the investigation findings. The district is committed to ensuring and maintaining a discrimination-free, harassment-free and bullying-free educational environment for its students." Community leaders say the district needs to do more. NAACP leaders said they've written a letter asking the district attorney to classify the incident as a hate crime.